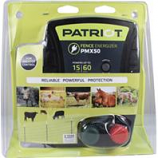 Great for rodeos horse shows or anywhere you need a portable electric fence for horses.. 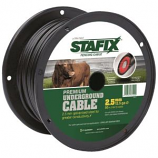 Kit includes: stafix an20 energizer no kick gate handle valve reel 660ft of 1/2in tape 12 plastic treadin post. Also included t-handle ground rod and carrying bag. . . Provides powerful protection for livestock against predators. Low impedance technology for effective reliable performance. Led indicator indicates if the energizer is on and working. 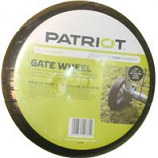 May be used with steel wire aluminum wire poliwire or polirope and politape. .
For use in the patriot solarguard 155 solar energizer. 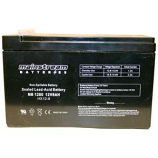 Replacement battery. Dimension - 6 x 2.5 x 4 in.. Voltage - 12v.. .
• Angled End Can Be Used To Connect Politape To Gate Handle. • Not Recommended For Dogs Under 15 Lbs Or Under 6 Months Old. The electric fence netting safely protects poultry and other small animals. Set up is fast and easy. Includes warning sign corner stakes repair kit and installation instructions. . . The electric fence netting safely protects sheep and goats and other small animals. The netting is portable and very quick and simple to install. Works for predator control. 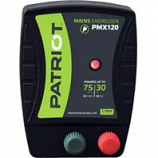 Includes warning sign corner stakes repair kit and installation instructions. . 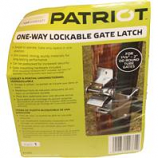 Provides smoother and easier means of opening and closing gates. Zinc coated strong sturdy materials for long lasting performance. Gate mounting hardware included. For 1 5/8-2 od round tube gates. .
For use on all post types. Effective end strain for termination of electric fence wires. 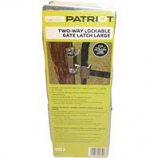 Use with most fence wire sizes. Excellent arcing protection to reduce shorting. Uv stable and designed for long life. Simple one handed operation opens gate from inside or outside. Zinc coated strong sturdy material for long lasting performance. Can be padlocked for increased security. Gate mounting hardware included. For 1 5/8-2 od round tube gates. 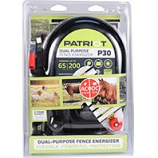 Designed for use with electric fence chargers or energizers. Used to insulate wire around corner or end posts. 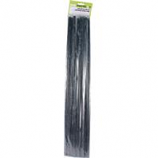 Works best with high tensile wire. Easy to use. .
• Made Of Solid Zinc For Long Life and Excellent Conductivity. More conductive than standard cable. Double insulated protection for long life. Increased diameter for superior conductivity. Soft galvanized steal core for easy handling. .
• Portable, Easy To Use.